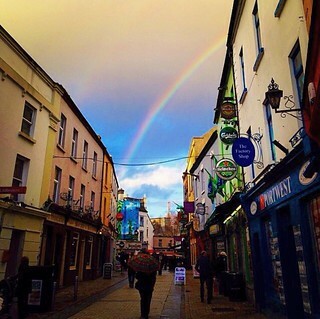 Galway, a university town with a vibrant artistic and cultural atmosphere, is the administrative capital of County Galway and the largest city in the West of Ireland. This area of the country is noted for its geographic and cultural distinctiveness. With the largest concentration of Gaelic-speaking communities in Ireland, the West is widely recognized as the most typically "Irish" part of the country. The Gaelic heritage is perhaps most evident in the Aran Islands (Inishmore, Inishmaan, and Inisheer), located just off the coast at the entrance to Galway Bay. Hobart and William Smith Colleges maintain an affiliation with the National University of Ireland, Galway (NUIG) to provide students with the opportunity to live and study among Irish students at an Irish university. Participants in the program are also encouraged to join one of the many university clubs and organizations in order to directly experience Irish student life and culture. Community service options are available and provide a unique opportunity for students to gain access to the local community. This course, an interdisciplinary survey designed to give students insight into important historical events and processes that have shaped Irish culture and society, is organized and taught by faculty from the Centre for Irish Studies at NUIG. A series of excursions are linked to this course and will serve to illustrate key themes and topics. The course examines community development and revitalization through several critical indicators of “community” including citizen community engagement, family support, family and individual self-sufficiency, educational achievement of children and youth, changing demographics, economic trends, environmental quality, housing stock, public safety, and participation in arts, culture and leisure. We will assess the opportunities and risks in Galway and the surrounding region. Students participate in community-based research. The course will draw on program excursions to different areas throughout Ireland to further immerse students in Irish history, culture and contemporary issues and to provide a comprehensive understanding and appreciation of Irish society. Ireland has undergone a period of tumultuous economic change during the last three decades. In the early 1990s, it began a transformation from one of the poorest countries in Europe, becoming one of the fastest growing countries in the world. It was dubbed the “Celtic Tiger,” in an allusion to the “Asian Tigers” nickname of the fast growing and transforming East Asian countries (Hong Kong, Singapore, South Korea, and Taiwan) of the same period. This period of Irish growth and transformation coincided with, and was connected to, a period of global growth, in East Asia and elsewhere, along with the “dot-com boom” in the US. When the dot-come bubble burst, Ireland experienced a slowdown, followed by renewed growth driven in part by a real estate and financial bubble. The global bursting of that bubble hit Ireland hard and the country experienced an extended and severe period of economic difficulty. Ireland has, to an extent, recovered from the lows of that period, but partially through a strategy which now finds it in a controversial role, as a tax haven for large wealth holders and corporations. This course aims to explain the Irish economic experience, place it in a global context, and examine how both the gains from and harms from this tumultuous period were distributed in Ireland. The course will be designed to encourage students to think from the “big picture,” global or macro-level trends, and next to how those trends are realized in individual countries/places, and, finally, how real people’s actual lives are affected. The Galway program is accessible to students from virtually any academic discipline as participants will be able to select two courses from the NUIG catalogue. Note that access for international students to some NUIG courses is limited due to such factors as the duration of the course and the nature of course prerequisites. Science students with very specific courses needs are advised to consult with staff at the Center for Global Education before applying to this program. This program is open to juniors and seniors (sophomores may be considered in exceptional cases) in good academic and social standing with a minimum GPA of 3.0. Students may be required to successfully complete a Reader's College orientation course during the semester preceding the program. Due to the challenging nature of study abroad, student academic and disciplinary records will be carefully screened. Several excursions linked to the Irish Culture and Society course are included as part of this program. They typically include visits to Northern Ireland, Dublin, Cork, Kerry, and the Aran Islands. Some local excursions in and around Galway may be organized as well. Students will be charged standard HWS tuition and fees, room fees, and a $600 administrative fee. This will cover credit for a four-course semester, health insurance, housing, and program-related activities and excursions. Note that no HWS board fee will be charged. Students should plan to bring their board fee to cover meal expenses throughout the program. Additional expenses not covered include airfare, visa, books, and personal expenses (laundry, entertainment, ground transportation, and independent travel). We estimate airfare for this program at $900-$1100 from the East Coast, visa at $350, and books at $250. It is difficult to give an accurate estimate of personal expenses because student spending habits differ considerably. We would suggest a minimum of $1500 above and beyond meal expenses. However, students on a tight budget should be able to manage with less. If you are concerned about finances we strongly encourage you to talk to the CGE staff who can offer information and advice based on your specific situation. IMPORTANT: The handbook(s) below is/are the most recent handbook(s) to date that have been uploaded by CGE staff. Program participants receive their updated copy of the handbook 2-3 months prior to their specific program's start date.